Muslim Missiles From Gaza Rain Down on Israel-Yisrael as Iron Dome Intercepts them!! IDF Reports that Nine Mortars in Total Were Fired on Southern Yisrael – Israel from Gaza!! “I was glad when they said unto me, Let us go into the house of the LORD. Our feet shall stand within thy gates, O Jerusalem. Jerusalem is builded as a city that is compact together: Whither the tribes go up, the tribes of the LORD, unto the testimony of Israel, to give thanks unto the name of the LORD. For there are set thrones of judgment, the thrones of the house of David. Pray for the peace of Jerusalem: they shall prosper that love thee. Peace be within thy walls, and prosperity within thy palaces. For my brethren and companions’ sakes, I will now say, Peace be within thee. Because of the house of the LORD our God I will seek thy good”. 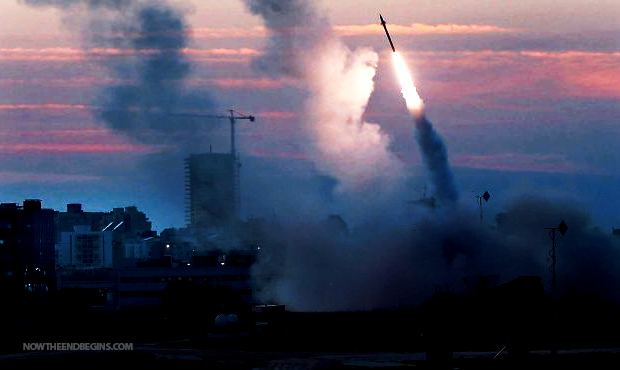 The Jerusalem Post reports that the Iron Dome missile defense system intercepted two rockets fired from the Gaza Strip over the southern city of Ashkelon and the Sdot Negev Regional Council on Wednesday evening, the IDF confirmed. In total on Wednesday, nine mortars from the coastal enclave landed in southern Israel, the IDF Spokesperson reported. The mortars landed in open areas in the Eshkol Regional Council. On Tuesday evening, five mortar shells were fired from the Gaza Strip toward southern Israel with two landing in the Eshkol Regional Council. The Tuesday attack came as the funeral was underway in Modi’in for the three slain Israeli teenagers. Early on Tuesday morning, the Israeli Air Force jets struck 34 targets in the Gaza Strip in response to a barrage of rockets that pounded Israel’s South on Monday. “Pray for the peace of Jerusalem: they shall prosper that love thee”. « Tell President Obama to Stop Funding Hamas! !